Appear Here connect landlords who have cool vacant spaces, with people who have great ideas for a pop-up. 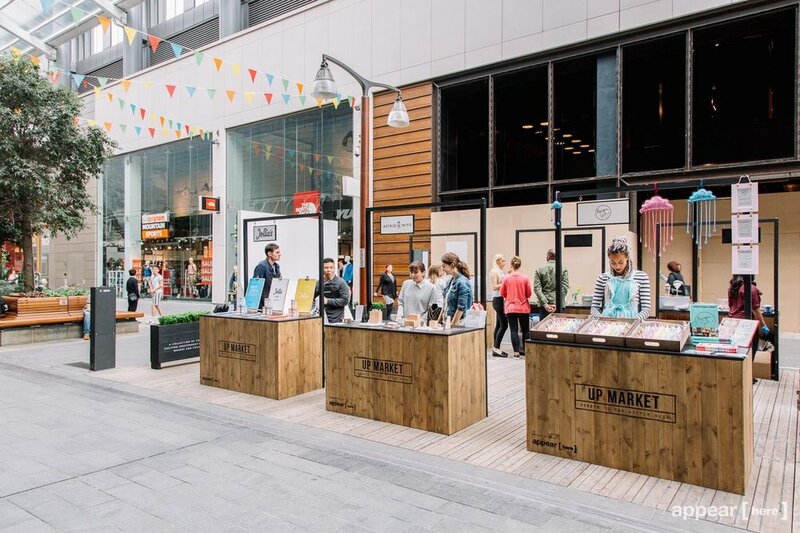 Their latest initiative for emerging entrepreneurs wanting to showcase their wares is a pop-up market at Westfield Stratford. 10 classic wooden market stalls are being made available to traders, and that's where we come in. We were delighted to design and build these premium Quirky Spaces, complete with a glossy black countertop perfect for trading. Each stall is clearly branded to create a coherent market area, and all traders will be equipped with a chic black and white panel on which they can display their own branding for the duration of their tenancy. Even better, whilst they are sturdy and weatherproof, the stalls can all be flat-packed at the end of the day for efficient storage. They are perfect for this weekend-only market! With the addition of bespoke, branded planters, the gorgeous Up Market is complete and ready for customers.